BANGKOK (AFP) — Thailand's foreign minister was forced during a censure debate Friday to defend himself against angry opposition attacks over his role in the protests that shut Bangkok's airports last year. Kasit Piromya is accused of supporting the ten-day airport siege in November-December by members of the People's Alliance for Democracy (PAD) that cost the kingdom 8.3 billion dollars and tarnished its tourist-friendly image. 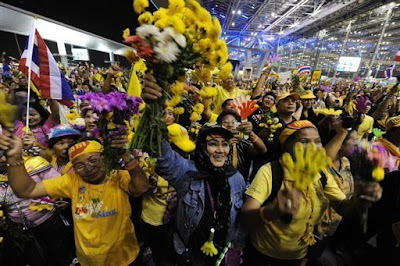 The 64-year-old reportedly said the blockade, the culmination of a four-month street campaign to rid former premier Thaksin Shinawatra's allies from government, was "a lot of fun". But Kasit played down his role in the protests. "I am not a core member of the PAD and neither have I taken part in their planning. I was invited to speak as academic," Kasit said, referring to a speech he made at the airport protest site. "I joined the PAD movement in good faith in order to achieve true democracy, a better society in Thailand and to oppose Thaksin's system," he said. A stream of opposition lawmakers addressed parliament during the second day of debate ahead of a planned vote of no confidence on Saturday aimed at toppling the three-month-old government. The censure motion accuses premier Abhisit Vejjajiva and five other ministers from the Democrat Party, including Kasit, of corruption and mismanagement. "The PAD and Democrats are the same group. 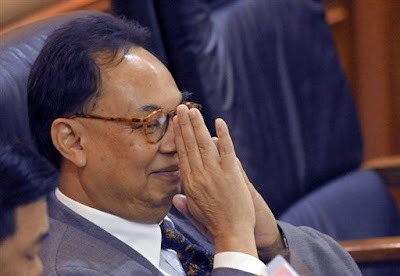 Kasit was appointed as foreign minister to repay him for helping to seize the airport," opposition MP Visaradi Techathirawat said. Another showed video footage of Kasit's previous comments on the protests and accused him of acting like an "international terrorist." The foreign minister is also accused of ceding territory to Cambodia following renewed military tensions on their disputed border that boiled over into a deadly clash last year. The opposition accused Kasit of allowing Cambodia to build a road on Thai land in exchange for securing Cambodian premier Hun Sen's attendance at a key regional summit that Thailand hosted last month. But Kasit said territory had not been lost and defended his conciliatory approach. "It's easy to fight, but people stand to lose, so we have to rely on peaceful negotiation... we are not losing any territory," he said. The attacks on Kasit follow a day of debate centred on Prime Minister Abhisit Vejjajiva during Thursday's session that concluded in the early hours of the morning. His Democrat Party is accused of receiving millions of dollars in illegal donations and illegally distributing funds, while it is alleged Abhisit certified false party financial statements and dodged military service. The move to censure by allies of fugitive former premier Thaksin Shinawatra is almost certain to fail but opposition lawmakers hope that the allegations will weaken the ruling coalition. Abhisit is named in the motion alongside Kasit, Finance Minister Korn Chatikavanij, his deputy Pradit Patharaprasit, Interior Minister Chavarat Charnvirakul and his deputy Boonchong Wongtrairat. The debate must finish by midnight Friday in order to allow a Saturday vote. Oxford-educated Abhisit took office in December after a court ruling toppled the then-ruling party allied to Thaksin. The Democrats subsequently won over parties that were part of the previous coalition government.